For the first time since the launch of the iPhone in 2007, Apple has overestimated the demand for its products and services. Apple CEO Tim Cook released a statement warning investors about the revised estimates for Q1 2019. Cook attributed the reduced revenue to the staggered iPhone launch, a strong U.S. dollar, and the slowdown in the Chinese economy. The points Cook emphasized in his letter point to the deceleration of the Chinese economy in the second half of 2018, which was exacerbated by trade tensions between the United States and China. Apple believes that this is what contributed to lower than expected iPhone revenue sales in this key emerging market. iPhone market upgrades in developed markets were also weaker than expected. Apple's sales in the first quarter (September to December) are now forecast to drop to $84 billion instead of the $91 billion estimated by analysts. Up until now, China was the third largest Apple market making up about a fifth of their business. 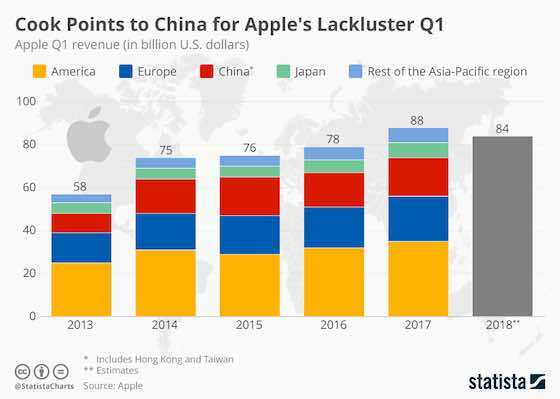 The U.S. and Europe were the two markets ahead of China, making up 40 percent and 24 percent of Apple's business respectively.